As some of you may know, I grow my own hops. I do it for a few reasons, none of which have anything to do with saving money. I love plants and gardening in general and like to think I have something of a green thumb. Also, as a brewer, it’s nice to have hop plants about the place. They are beautiful plants and grow extremely fast, so I constructed a trellis of sorts which stretches over my front patio deck to provide some shade during summer. Those of you who live in the UK will also know just how on top of your neighbours you are when you live in a terraced house like I do. My hops provide some welcome extra privacy as they prevent the neighbours from seeing directly into my yard. I started last year from a small hop cutting, given to me by a fellow brewer from whom I bought some corny kegs. He told me at the time that it was a Saaz plant, from the Czech Republic, and since I am extremely partial to a Czech pilsner, I was very happy to have it. I immediately split it into two small hop plants in fresh soil, before reading online later that evening that I should really have kept it whole until it was bigger. It didn’t matter, it had done it’s job as I was now hooked on growing hops. Through a fair bit of effort, I have since managed to acquire a selection of other hop varieties. I bought some from a lady on ebay who propogates them, and I got two more from other brewers. I now have seven large, second year hop plants in large pots (I don’t own my house, so as a renting tenant I’d like to be able to take my hops with me when I leave), namely two Saaz plants, and one each of the following: Mt Hood, Willamette, Sterling, Cascade and Hallertau. I was told that I would be unlikely to harvest much, if anything from first year plants, but this turned out to be untrue. While my Hallertau and Sterling plants didn’t grown very fast or produce much, I got enough from my Mt Hood plant to brew a Homegrown German Pilsner, and enough from my Cascade plant to brew a Homegrown APA, both of which turned out pretty well. I also got enough from my Willamette and Saaz plants to brew two more beers, I eventually got round to using my Saaz last weekend (watch this space) but have yet to brew a recipe with my Willammette. I found the the homegrown hops had an interesting, different flavour to their commercial counterparts. I believe, also, that the flavour is directly affected by when they are harvested (ripeness), as well as the terroir in which are grown. I live in Essex, right next to Kent, so I guess this is pretty ideal and the hops do seem to love it here. Here are a few pics of last year’s growth for those interested. For a more complete write-up of last year’s harvest, visit the JBK Forum page here. Your harvest looks exceptional, Gaz. I’m far from green-fingered but I always think that greenery looks far nicer in gardens than those attention-seeking flowers! I was wondering, when brewing with your own hops, what sort of provisions do you make in terms of the alpha acid? Do you generally just work within the parameters of how bitter/aromatic a hop variety usually is, and how dramatically can this vary? Thanks, I tend to agree with you! I really like how the hops provide shade and shelter when trained into a pergola of sorts. They’re such beautiful plants – I believe you can even make wreaths from the bines when the plant dies, but I haven’t tried this yet. Also, you can eat the baby shoots if the urge takes you, they are a lot like asparagus and are considered a real delicacy in Belgium called jets d’houblon. Wrt alpha acid content, well I kinda make an educated guess. 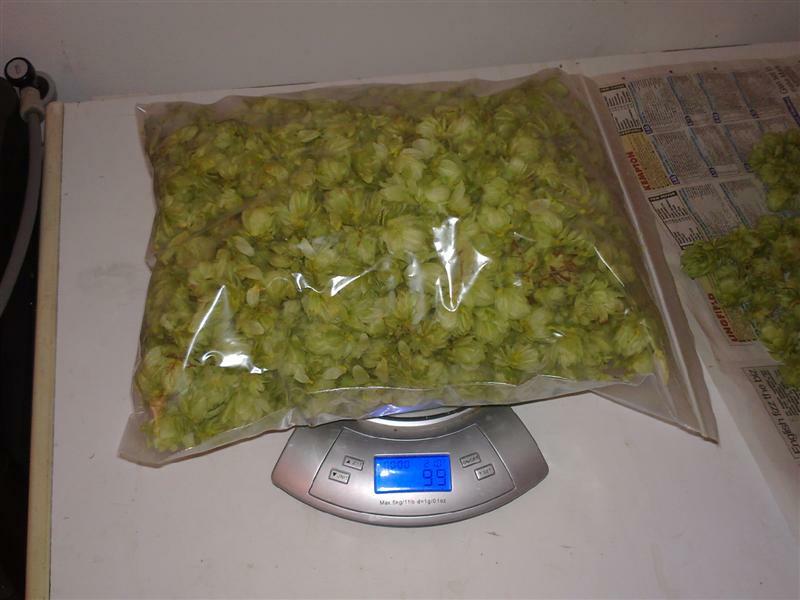 I factor in the level usually found in a commercial bag and also how much yellow lupulin I find in the cones at harvest, although apparently home-grown hops are much lower in alpha than commercial-grown hops. For the higher alpha varieties like the Americans, I’ve worked on an assumption of about 3%, and 2% for the old landrace cultivars. To remove some of the guesswork, I use a commercial hop to bitter my home-grown beers and only use the home-grown hops for flavour and aroma, so if I’m out by a bit in my estimation, it doesn’t make too much difference. Thanks Gary. I’m also in a rented gaff but with no garden, but that question has been nagging at me for a while. Thanks for the guide. Also thank you for the ‘jets d’houblon’ tip-off. I’m going to follow that one up for sure. Congratualtions on the success of the Pale Ale. Herewith wishes for continued success. All things being equal, your beer should arrive on SA shores in about September 2074. To avoid this delay, I think I should either make a pil(sner)grimage to the UK to sample some – or hijack the freight plane (a pastime in which some South Africans appear to excel). As a rank beginner in this fine and venerable occupation but one who is interested in the whole brewing thing, I’ll be visiting on a regular basis to learn. I’ve put up some more thoughts and notes; hope it helps. Thanks for the kind words. Glad to hear you’re thinking of taking up the most rewarding hobby on earth! But make sure K keeps her rabbit away !